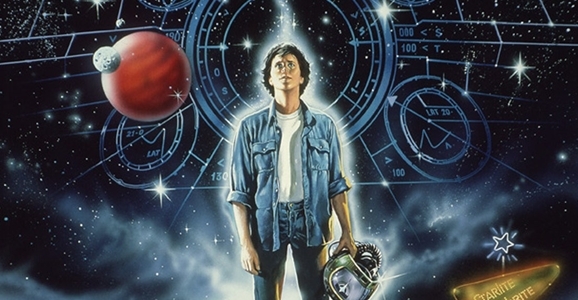 Be Good: Eight Family Friendly SF Flicks To Double-Feature With E.T. Steven Spielberg’s classic film E.T. hit Blu-ray this week, so I got to thinking about something that’s one of my favorite things to do: a double-feature. Sure, sometimes the schedule is so hectic that you’re luck to be able to sit through one movie, much less two. But there’s just something enormously satisfying about the double feature, especially if you’ve put some thought into picking the perfect pair of films, whether they’re united by genre, theme, creative talent, or even some obscure joke only you and your friends understand. I’m betting some of you will be picking up E.T. on Blu-ray and watching it for the first time in a while, or maybe ever showing it to your kids for the first time ever. Because GFR is a full-service kind of place, I’ve sifted through the heaps of cinematic history and pulled out eight family friendly science fiction movies that will pair quite nicely with E.T.. We hope the results will be something to phone home about (ahem). The Spike Scream Awards are set to air tonight, but we already know which movies are the winners. The one that should matter to you most, if you’re a regular reader of this site, is their award for best Sci-Fi movie. That went to Super 8. Super 8 was kind of a let down, but still a well enough made film, so I guess that awarding makes a certain kind of sense, particularly if you’re only looking at mainstream movies. A lot of critics probably would have lobbied for Attack the Block to win instead and personally I’d have gone with Paul, Rise of the Apes, or even Source Code ahead of Super 8 as the year’s best sci-fi so far (though I hope it’ll end up being John Carter before 2011’s said and done). Other sci-fi centric winners include Milla Jovovich as Best Sci-Fi Actress for her work in Resident Evil: Afterlife, and Matt Smith as Best Sci-Fi Actor for being an awesome Doctor on Doctor Who.